We get asked all the time how to grow alfalfa sprouts. We’ve been growing it for a long time, so the question doesn’t come as a surprise to us. If you grow alfalfa sprouts, you’ll want to read this short post for a quick overview, and refer back for more detailed articles later. It is meant to be very general for the beginner, while following articles and links become more seasoned. We’ll be posting updates as we get questions and feedback. Enjoy your Sprouts! Cracked seed due to poor cleaning – This will not germinate, which means no sprouts. Seed that came into contact with chemicals – Not good. Old seed with poor germination rates – Any reputable seed supplier can give you germination statistics. Don’t just assume that if you found your alfalfa seed at the local health food store that it is quality. They often order from supply catalogs, and do little to no research about what they are selling. Also look out for GMO seed. If you do you homework you can find some sources. We always use organic suppliers that are licensed to handle and process organically. That way, we know what we are working with. 2. 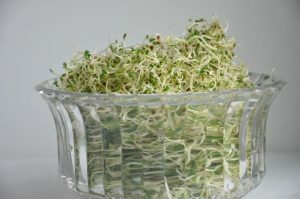 Wash’em – before you grow alfalfa sprouts, wash your seed! How important is this step? Very, very important. Washing your seeds is vital before you grow alfalfa sprouts. This step removes dust that clings to the outer hull of alfalfa seeds, and helps improve the length of time your sprouts keep well in the refrigerator. You will be amazed at this step if you do it correctly. There has been quite a debate over whether to soak or rinse your seed initially. We are very persuaded that soaking for 8 to 12 hours is essential. We could get into long discussions about germination and quality of the sprouts because of soaking, but soaking provides one more very important opportunity; cleaning! If you look at a seed under a microscope, it looks like caverns, canyons, and crevices. Soaking the seeds makes those areas plump and smooth to where you can clean them once more for the best sprouts you can produce. Cleanliness of the seed is very important. This is the last step of maintenance before you grow alfalfa sprouts to ensure you have a quality sprout ahead of you. Clean those seeds one more time, and make sure that once they start to grow, you’ll be happy with the results. If you pay attention when you grow alfalfa sprouts, you’ll have a long white stem with beautiful green leaves that mirror each other. You want to focus on green sprouts that reach a good maturity and ample length. Make sure you water them at least twice a day, and give them plenty of indirect light. Hulls on sprouts are often the remark of salad enthusiasts. If sprouts are We’ve learned some strategies for eliminating hulls, and washing sprouts. 7. Cool’em – keep them in the fridge and enjoy when needed! Cold sprouts keep better. Keep them covered in such a way that they can breathe, because they are still alive! Live Food = Good Food. Follow these steps for the longest shelf life. 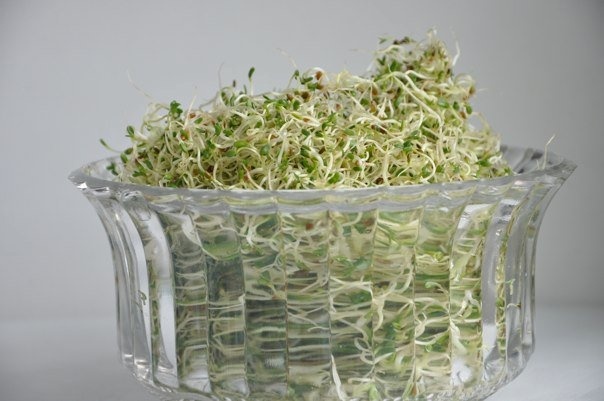 Share the post "Grow Alfalfa Sprouts – Its Easy"